Spring semester is here, but winter isn’t over yet. Stay out of the cold and immerse yourself in some new VR games available on the library’s HTC VIVE instead. The Virtual Reality Gaming Room (room N275) is on the 2nd floor of Library North, across from the Technology Support Desk. Thanks to the Arthur Vandenberg Library Innovation Fund, we’ve been able to add more VR games for both education and recreation. 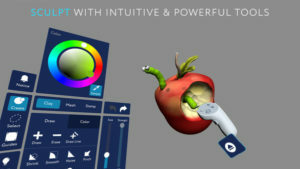 The artistically inclined may enjoy 3D painting and modeling in Tilt Brush or MasterpieceVR. 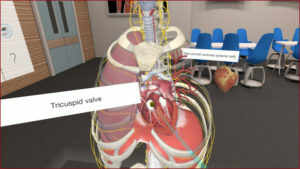 Students taking anatomy might be interested in using 3D Organon VR or Physiology of the Eye to study for the next exam. If you’re just looking for something fun, you might try Rick and Morty: Virtual Rick-ality or Space Pirate Trainer. A more complete list of purchased games is viewable from the blue “Info” button on the reservation page. The room can fit up to four people at a time, but your friends may be tempted to record your VR flailing. Tweet us your best and worst VR moves @gsu_library. This entry was posted in For Students, General News and tagged anatomy, games, gaming, Rick and Morty, virtual reality, VIVE, VR. Bookmark the permalink. One Response to New VR Games for Play! I actually never knew there was a VR headset on campus! I have been using VRChat for some time to interact with other students but will definitely be checking out the physiology games.